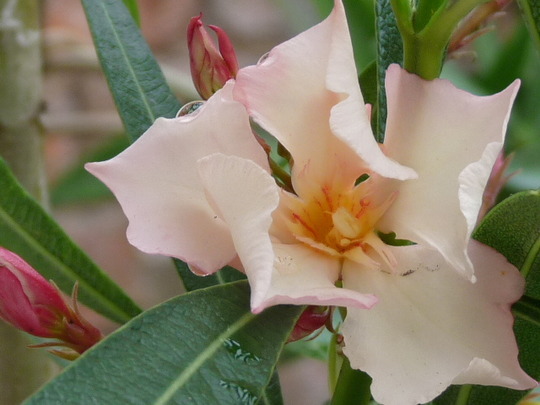 We brought two Oleander cuttings back with us when we came back to the UK, and 3 years on, the first flowers! Love this colour Janey ! You must be thrilled Janey. this is a fab bloom.....!! Very beautiful! Reminds me of my Portugese holiday! Gorgeous colour too! Wonderful Janey. What do you do with them in the Winter. Yes it is Janette....I've been feeding them with Miraclegrow, and with the hot spell...they've loved it! No, not worth the risk is it Janey. I was bought an Oleander Bush by my mum-in-law this year and was amazed how well it flowers - they jus seem to keep on coming. That's a pretty colour too. This photo is of species Oleander - Adelphi.